Specialist Decorating Stencilled Frieze Mural London U.K. This stencilled mural at frieze height ran around a child's bedroom. The colours for the design were pulled from the matching curtains, cushions and other soft furnishings to produce a highly coordinated look. 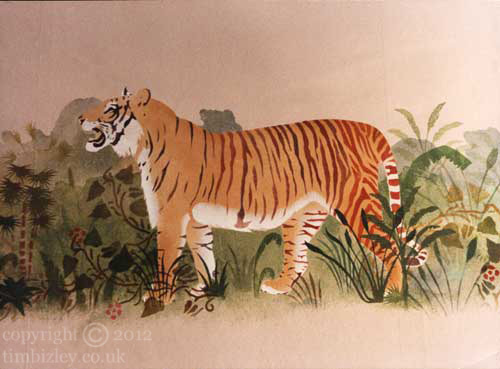 The stencil is bespoke and a hand cut multi-separation version, allowing a build up of different colours and tonal variations, such that in the finished work all the tigers were visually unique in terms of colour and tone and set within a unique jungle back drop. The stencil is an important tool for use in specialist decorating and results in its own unique look. This work was undertaken in London, for an interior designer.